I had a productive night last night with all my friends for Wendy's Friday Night Sew In. I joined approx 50 ladies for a virtual sewing night. I'm happy with my progress on my GDITC project. I finished my second and third stitchery for my Lynette Anderson table runner and two hexagons, so I am very pleased. Thank you to everyone that joined me last night! If you would like to see what everyone got up to last night, take a look HERE. Now that looks lovely......I am a huge fan of Lynette Anderson! I don't know if I have been to your blog before but I have clicked the follow button now so I won't miss a thing! Youre making great progress on this. It's a lovely project. These are looking very cute Deb! Your blocks look lovely, Deb. Lovely blocks and I can't wait to see the runner finished. 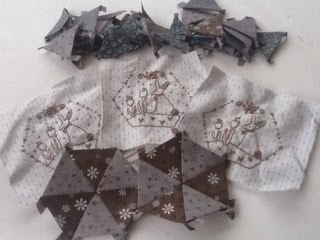 Love these hexie stitchery blocks, it will be lovely when finished :) Barb. You sure did have a productive night, those are darling!! These are too cute Deb! !